Knocked out Soviet BT-5 fast tanks (Bystrokhodny tank) are inspected by Finnish troops. The BT-5 was a derivative of the American Walter Christie designs, and was in production from 1933-1934. It mounted a high velocity 45mm gun and a ball mount machine gun. While the BT-5 outclassed its Japanese opponents in the Manchurian border clashes in August 1939, the Finns relied on highly mobile ski troops armed with British Boys 13.9mm (.55 inch) antitank rifles (called the 14mm pst kiv/37 in Finnish service) and captured Soviet weapons could maneuver around the tanks, which were unable to leave the few passable roads. The outnumbered Finns broke up the larger Soviet formations, seeding confusion and fear. These smaller groups (called "Motti" by the Finns) would then be cut off from assistance and annihilated. the Finns fcoused on the logistics columns, field kitchens and supplies, immobilizing the combat formations. During the Battle of Suomussalmi, the Finnish 9th Division of 6,000 men cut off the Soviet 163rd Infantry Division of 25,000 men and destroyed it. 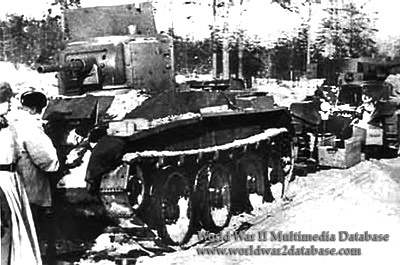 The Soviet 44th Ukrainian Motorized Infantry Division was sent to reinforce the 163rd, but on the Raate Road the Finns set up an ambush, cutting off units of the 44th and destroying them in turn.